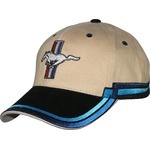 Ford Mustang on a tan with blue and black trim new ball cap with tags. On the rear is the Ford logo and Mustang on the black velchro strap. Just 2 left.